Smoking kills 7 million people a year, and it scars the planet through deforestation, pollution and littering. About 11.4 million metric tonnes of wood are utilized annually for curing: the drying of the tobacco leaf, which is achieved through various methods, including wood fires. That’s the equivalent of one tree for every 300 cigarettes, or 1.5 cartons. 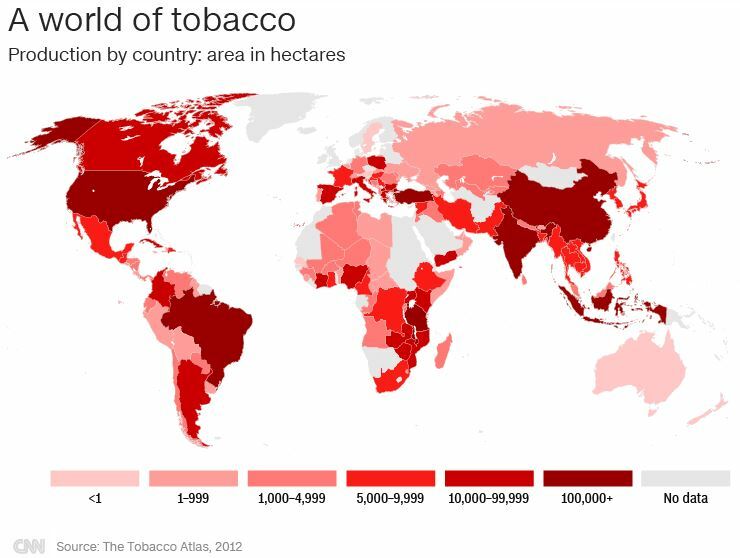 In 2012, 967 million daily smokers consumed approximately 6.25 trillion cigarettes worldwide, the WHO estimates. “That means about 6,000 metric tonnes of formaldehyde and 47,000 metric tonnes of nicotine are released into the environment,” Peruga said. What happens to the cigarette smoke once a cigarette is consumed? Scientific evidence shows that harmful compounds emitted by cigarettes persist in the atmosphere over time even after they are consumed. The first evidence of tobacco atmospheric pollution and its effect on public health based on data from three countries will be presented to the public by Dr Noel Aquilina on Wednesday at 6pm at the office of the Azad Foundation, 224, Republic Street, Valletta. His presentation is entitled ‘Cigarette smoke: The invisible harm’. According to the World Health Organisation, six million people die every year due to tobacco use and it is projected that by 2030, this figure will rise to eight million people per year. In 2014, 5.8 trillion cigarettes were consumed globally. An estimated $9 billion is spent yearly, or $1 million per hour, by the tobacco industry to promote tobacco use. Although awareness has increased throughout the years, smoking is still on the increase especially in southern and eastern Europe and China. Dr Aquilina graduated with a BSc in chemistry and physics in 1994 and an MSc in atmospheric physics in 2001 from the University of Malta. In 2003 he participated in a European project in Portugal, working on meteorological modelling or urban areas and how this affects indoor air quality. He obtained a PhD in atmospheric chemistry from the University of Birmingham, UK, in 2009. His main study was the measurement and modelling of personal exposure to organic pollutants from different sources. That same year he carried out research on indoor air quality in the Lawrence Berkeley Laboratory in Berkeley, the US. In 2016 he was invited by a University of California research consortium in San Francisco, US, to study the effect of third-hand smoke on the air, among other effects. He is a now a senior lecturer in the University’s Department of Geosciences. He forms part of the Atmospheric and Climate Research Group that carries out research in the sciences of the atmosphere and leads the group that focusses on regional climate modelling. This is the fifth presentation of PhD research that Azad Academia is holding this academic year. For more information e-mail azadacademia@gmail.com. Smoking: Researchers say that a new air-cleaning filter can get rid of all the harmful smoke substances in a room where ten people are simultaneously smoking in less than an hour. The filter is coated with a manganese oxide-based nano-catalyst, which can be used in a smoking room to reduce and purify major harmful substances of cigarette smoke. The air cleaning equipment based on the newly-developed catalyst can purify over 80% of the cigarette smoke within 30 minutes and 100% of it within an hour, in a 30 square meter smoking room, where 10 people are smoking simultaneously. Activated charcoal-based filters are mostly used in a smoking room to remove gaseous materials from cigarette smoke. However, those filters are not effective in removing gaseous materials such as acetaldehyde. Their absorption performance decreases fast in a closed facility such as a smoking room, and they need to be replaced at least every other week. The nano-catalyst filter uses a technology that decomposes elements of cigarette smoke using oxygen radical, which is generated by decomposing ozone in the air on the surface of the manganese-oxide-based nano-catalyst filter. An evaluation test with total volatile organic compounds (TVOC), such as acetaldehyde, nicotine and tar, which account for the largest volume of gaseous materials in cigarette smoke, was conducted to evaluate the performance of the newly-developed catalyst. The results showed that the new catalyst decomposed over 98% of the harmful substances. “The new air cleaning equipment based on a simple catalyst successfully processes and removes gaseous materials in cigarette smoke, which are not easily removed with the existing air cleaning technologies,” said Dr Jongsoo Jurng of Korea Institute of Science and Technology (KSIT) in Seoul, who led the study with Dr Gwi-Nam. “If the new equipment can be simplified and is economically feasible, it will be an important tool for keeping smoking room pleasant and clean. Also, from the convergence perspective, the new nanometre catalyst filter can be integrated with other air cleaning products such as air purifiers and air conditioners,” Jurng said. Two weeks ago, an investigation by Greenpeace revealed that the fossil fuel industry had for years paid a scientist frequently called upon by Republicans and conservative pundits to deny climate change. The scientist, Willie Soon, had received more than US$1.2 million from oil and gas companies in the last decade. There’s a name for people like this: Merchants of Doubt, which is the title of a 2010 book and a documentary film premiering today in New York City and Los Angeles. Both the book and the film detail the extent to which front groups and bought researchers create an appearance of scientific uncertainty around climate science where none exists, using the same tactics the tobacco industry used to sow confusion about the links between nicotine and cancer. Paying individual scientists to produce dubious research is a small part of what’s come to be known as the climate-denial machine, in which oil, gas, and coal companies and their allies create front groups that develop their own reports and research to slow the progress of regulations and the switch to cleaner energy sources. And since the Supreme Court’s 2009 ruling in Citizens United v. FEC, it has become commonplace for donors to obscure where their money is going. A 2013 Drexel University study found that $558 million had been funneled to about 100 different climate change denial organizations between 2003 and 2010. The effect of all this has been to create the impression that there’s doubt among the scientific community about the causes, and even existence, of climate change. While there are extensive questions about the precise impacts of climate change and the time scale on which it will operate, 97 percent of the scientific community is in consensus that burning fossil fuels is causing the planet to warm. In response to the news about Soon, Democratic senators Edward Markey of Massachusetts, Barbara Boxer of California, and Sheldon Whitehouse of Rhode Island sent letters to 100 companies and industry organizations asking them to disclose any funding they have provided to scientists. Arizona Representative Raul Grijalva, also a Democrat, sent letters to seven universities requesting information on researchers who had spoken in opposition to the scientific consensus on climate science. Smoking in the home may be causing as many fatalities as road traffic collisions according to new research commissioned by the Environmental Protection Agency. The research entitled â€˜Indoor Air Pollutionâ€™ shows the concentration of damaging particulates in the air in the homes of those who smoke indoors was six times higher than the World Health Organisationâ€™s recommendation for general outdoor air quality. The research was completed by NUI Galway and staff at the University of Aberdeen, the Institute of Occupational Medicine Edinburgh, and the University of Birmingham. It concluded there was a glaring need to address the policy and health implications of smoke in private homes. Dr Marie Coggins, NUI, Galway said air quality in homes using the solid fuels coal, wood, peat and gas was mostly comparable to that of outdoor air. However smoking at home created much greater levels of air pollutants, with particulate pollution were up to 17 times levels found outdoors. The impact of exposure to such levels, on vulnerable groups such as children, in homes where smoking occurs indoors â€œneeds urgent action,â€ he said. As I am writing this, the air is “hazardous” as it has been for countless days over the past month. Days of wearing masks when I go outside has got me thinking about how things have gotten this bad and why little is being done to stop it. We all know the most common answer. Putting limits on air pollution means lost revenues and hurting the economy. Because of this, China decides that it would rather continue breathing in harmful air because the economic benefits outweigh the dangers. It can’t quit. Now let’s take things down a notch or two, from a national level, to an individual level. Just like smog, smoking can lead to cancer, heart disease, and birth defects. These threats have been proven, and are hurting and killing the ones we love and care about on a daily basis. And just like smog, decisions are made by smokers day after day to ignore these risks and to continue to smoke. And their decisions don’t just affect them, but, thanks to secondhand smoke, the people around them. The reasons why people smoke are many. Some do it because it looks cool, others because it feels good, and more yet because of peer pressure. But in the end, the decision is made to breathe in toxic air. And, as everyone knows, once you start, you become addicted, and it’s very hard to quit. However, when we scale up, the same factors apply. Just as air pollution is largely driven by the government’s addiction to GDP over improving air quality, the smoking industry continues for the same economic reasons. The National Tobacco Corporation (NTC), the State-owned tobacco monopoly, itself makes up a massive 7 to 10 percent of government revenue. Should the government actually enforce the smoking laws that have been in place for years, the NTC would be affected, and as a result, government revenue would decline. And we are all aware that that this is sadly unlikely in this “getting rich is glorious” society. The NTC which produces the dangerous smoke people choose to breathe and the factories which produce the smog we unwillingly breathe hold massive influence when it comes to government decisions. The result is a smoking culture pushed by big tobacco and a country which continues to be blanketed in air pollution, all in the name of GDP, without heed to people’s lives. There is a catch in all of this, however. As the quality of life decreases and GDP continues to be a priority, China may find that its rich, along with the businesses they are attached to, will increasingly flee the country. It may also find that foreign firms might opt for a more livable country to do business as well. This may already be happening, diminishing China’s current GDP efforts. Aside from GDP, ignorance is perhaps an even more disturbing cause for China’s current society of smoke. We might be well-informed about the dangers of smog and smoking, but the sad truth is many in China are not aware of the dangers. According to the International Tobacco Control Policy Evaluation Project in 2009, a mere 68 percent of Chinese smokers believe that smoking can lead to lung cancer, and just 54 percent of smokers believe that secondhand smoke causes lung cancer in nonsmokers. There is a major lack of awareness in China over the harm smoking can cause, and it wouldn’t be a surprise if this deficiency was intentionally caused by the interest groups previously mentioned. However, if so many smokers refuse to believe the harm cigarette smoke causes to their bodies, it diminishes the danger posed by hazardous air pollution, making ignorance yet another reason why the smoking culture is detrimental in efforts for cleaner air. In such circumstances, while people discuss GDP growth as the main driving force for the harmful smog we are often exposed to, we should also consider China’s smoking culture and all that comes with it as just as detrimental. After all, if the air inside the restaurant is just as dirty as the air outside, the psychological impact of the pollution is lessened. Until this smoking society is done, dangers will continue to be ignored, and the population will continue to get sicker. In China, like it or not, we all are smokers.